So a number of people had asked me to let them know how I was getting on with the battery refresher experiment of mine. The 12V battery refresher "reverse feeds a small electrical pulse back into the battery which prevents and also reverses sulphation on the battery plates" according to Sterling Power from whom I bought their Pro-Pulse. I can report that it has been a success, my battery bank is definitely holding it's charge better. It did take a while to see an improvement in performance, but that was exactly as predicted. I've been so impressed with the positive results, that I've gone out and bought myself a second refresher. 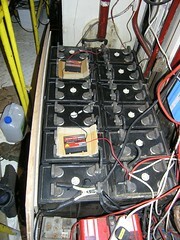 Now the entire 24V battery bank is looked after automatically. Those of you who know me, and have been down to Lady Jane, know what a big fan I am of my wind generator. Last weekend the generator, which has run perfectly happily for almost three years, had suddenly stopped working for some unexplained reason. I am completely reliant on power that I make for myself, so not having the wind generator has an immediate impact on me. For example often on windy weekends I don't need to run a generator at all, as the wind generator provides sufficient power to keep the batteries topped up. Conveniently, Robin was on board to help with the main engine so his talents were diverted to helping me get the wind generator down. 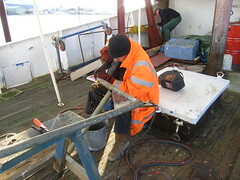 Here you see Robin building a new gantry to help fetch the wind generator down from atop the mast. The last one he made has disappeared, probably during one of the big clear outs I've had. By the way, you can also see Fred working away in the background there as well. Anyway, after a brief struggle Robin and I got the generator down from on high by using the time honoured method of cutting the thing down. It was well jammed into it's fitting and resisted all efforts at 'friendly persuasion' to get it off. It's now winging it's way back to the manufacturers, Eclectic Energy, to see what the problem is. Incidentally, I'm featured in one of their monthly magazines (April 05). Hopefully it's just something simple, and quickly put right. Here I am, standing by my main engine. The big smile on my face is on account of the air start finally being sorted out. It took a visit from Robin to actually get it fixed. As it turned out, I was fiddling with completely the wrong thing. When it comes to big engines and steel boaty stuff, Robin is the man. Even if I had been fiddling with the right thing, there is no doubt that I would not have sorted it. I could well have made things worse in fact. Anyway, now I know what to do next time an air start valve gets stuck. The good news is it's actually relatively simple to fix. 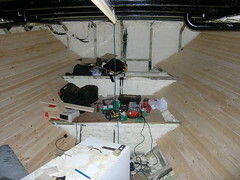 The woodwork is not the only below decks project on the go on Lady Jane at the moment. 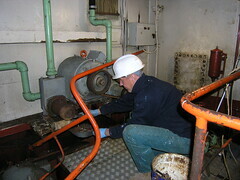 Here you see Fred slaving away on the engine room cleanup and painting project. 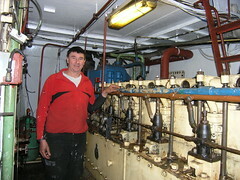 The big engine you can see right in front of him is the electric motor for the bilge pumps. 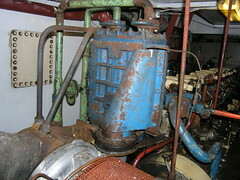 The main pump is just visible to the right of the motor there. The other pump, to the left of the motor, is a standby one which can also pump seawater through the cooling system if needs be. Oh yes, I know that orange guard rail really should be secured... It's on the list. This is a massive big project, but taken a bite at a time it's not so bad. So here is the start of what will be the finished product. 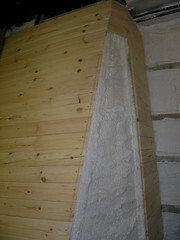 This small section took an amazingly long time to do, and quite a few 'adjustment' cuts. This was pretty much all pioneered by Andy who slaved away at achieving perfection there. The problem with working in wood is that once you have cut something short, even a little bit, you have to start again with a new piece. The reality with this particular section is that it's going to be a labour intensive job, which cannot be rushed. Oh, and I've also just remembered that there are two of these sections to do. As you can see from the look of the top few bits now in place, the tedious work is going to be worth it in the end. So we went for the big bang approach, in line with that suggested by an anonymous contributor. Cutting and fitting each individual piece would have been just too much work, for no real benefit. In the background you can see both the trimmed 'outside' edges (clicking on the image will give you a better view). Now for the tough part, as you can see Andy is helping with the tricky part of working out all the various angles the middle pieces will need to be cut at. By this stage we had already cut some of the top pieces wrong, and were resorting to more scientific means. It's a good thing I finally remembered where there was a protractor on board (Thanks Dave). So this is how I've been getting the wood I've been using out to Lady Jane. 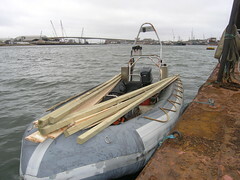 Here the rib (hbi) does duty as the marine equivalent of a mule. I've been a little surprised by just how much wood the aft accommodation space has consumed. Even the good folks over at Elliotts are beginning to question where all that wood is going. They very kindly pass it to me at the marina over their back fence, as their yard is right behind the marina I'm at, saving me a load of hassle. All legal and above board I hasten to add. Fred has also been whiling away at what has become almost completely his project on Lady Jane. Here you see the last of the woodwork over the insulation is now in place (ignore the battens holding the wood there while the glue dries). 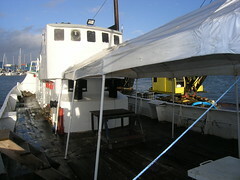 Oh, I thought to mention that the insulation stops just there, as the wheelhouse is above that. 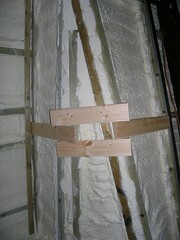 So I figured there was no need for insulation all the way across. All this needs now is some primer and a few licks of paint and it will be looking just peachy. So after successfully dealing with the challenges of covering the curves of the hull on both the port and starboard sides, with plenty of help of course, I now have this peculiar shape to deal with, at both port and starboard. I have screwed in a few pieces of wood to the battens in place, a little crooked I know, to help me think through how I'm going to do this. I am in no doubt that there is going to be some cussing involved, and more wood for the summer barbeques, before this is complete. So that's the wood cladding on both the port and starboard sides done (ish). Thanks once again to Fred for the help. I know it's a bit messy looking down there, but it is a work in progress you know. 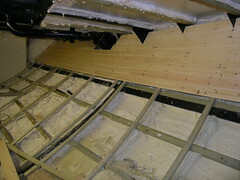 There are a few bits that still need doing right by the deckhead (ceiling), but that should not take too long. The next step will be to put the wood on at either end, making the space down below look and feel so much better than ever. The smell of all that freshly cut wood down there is simply wonderful. This should be the last coat of primer. Hopefully, my next visit down to Lady Jane will be with plenty of sunshine, and no wind, so I can at last get that bit all blue. I have no idea how long it's been since Lady Jane was one colour all the way round, so this will be somewhat of a momentous occasion. 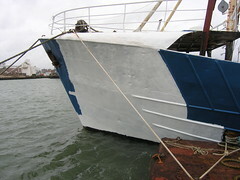 The painting work on the outside of the hull does not stop there though, as I have a section towards the stern on the starboard side to rust bust and paint, and the section which has so far been in the shadow of the crane barge on the port side to do. With the painting of the outside of the hull above the water line almost complete, it's time to start thinking abut getting Lady Jane out of the water to get her bottom done. A while ago, in June 2006, I wrote about the fate of the yacht Legacy. By way of an update, I see that the saga still continues there - a year and a half later. 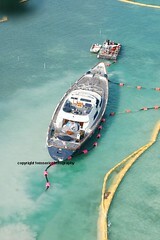 The posts about the Legacy on yachtforums.com are well worth a read, well most of them anyway. It's from there that I stole this picture. I can't help wondering what I would do if it was Lady Jane in that position. I certainly could not afford the sums of money they are pouring into salvaging the Legacy. The recent windy weather has been a bit hard on my poor old gazebo. It does not look that squiffy in the picture, but in real life it's now a bit of a sorry sight. What is quite interesting is how all the sealing tape on it has suddenly started coming undone in all different parts of the gazebo almost all at once. So here is a small, but rapidly growing, problem for me. 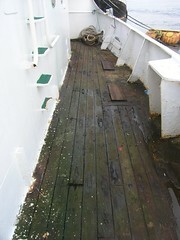 While hosing down the deck with salt water, I noticed that the wood on this part of the deck has rotted away far quicker that I'd imagined it would. You can see holes in the wood where water now sits, helping to accelerate the process. Ultimately that water is also sitting on the steel beneath the wood, in turn causing it to rust. This is something I'll need to sort out pretty quickly, as the last thing I need is for the underlying steel to eventually rust through to the spaces below. The immediate issue I have is what to do about it right now. An unexpected spell of sunshine over the weekend gave me the opportunity to paint. Here you see the results of a second coat of primer on the whole of the forward section. 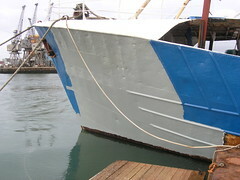 Not long now and the hull will, at last, be blue all the way round. After a recent weekend away, I returned to discover this mess on the back deck. Thankfully there has not been a repeat episode since. Work on the engine has taken a bit of a back seat recently, this is set to change. The next engine project on the list is to sort out the intercooler, this is on the heels of the turbo refurbishment last year. By way of a reminder, the turbo is effectively a compressor, compressing the air coming into the engine. The exhaust pressure is what drives the turbo, sort of like you would push a revolving door in a big building. As air is compressed it heats up. 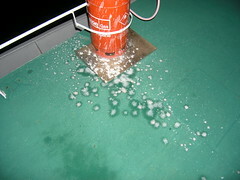 Hot air is less dense than cool air so to some extent this reduces the effectiveness of the compression. This is where the intercooler comes in. Sea water is pumped through pipes which run through the blue box you can see just the other side of the turbo, where the air is compressed. The cool sea water running through this box then cools the compressed air, making it more dense. This blue box is the intercooler by the way. More, dense, air into the engine means more power and in turn means more exhaust gasses with which to push the turbo even faster, compressing even more air, making the engine run progressively more efficiently. Now the problem with my intercooler is, I believe, the box itself has been gummed up over the years so now the necessary volumes of air simply cannot get through the box fast enough. 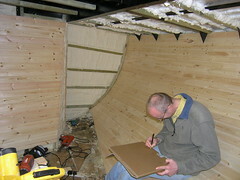 With Fred's help, I've made a start on the woodwork on the port side. I've done almost exactly the same as we did on the starboard side, but with the experience of 10/10ths hindsight. 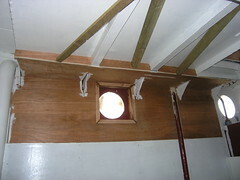 The most noticeable difference being finishing the woodwork at the very top first. So far the port side has been much easier all round, although I've a long way to go yet. Given the sheer amount of time off of my day job in the last few weeks, you would have expected to see much more progress. Sadly for poor old Lady Jane, the turkey, champagne and socialising took a bit of a priority. Anyway, with the festive season well behind us, things should be back to normal.